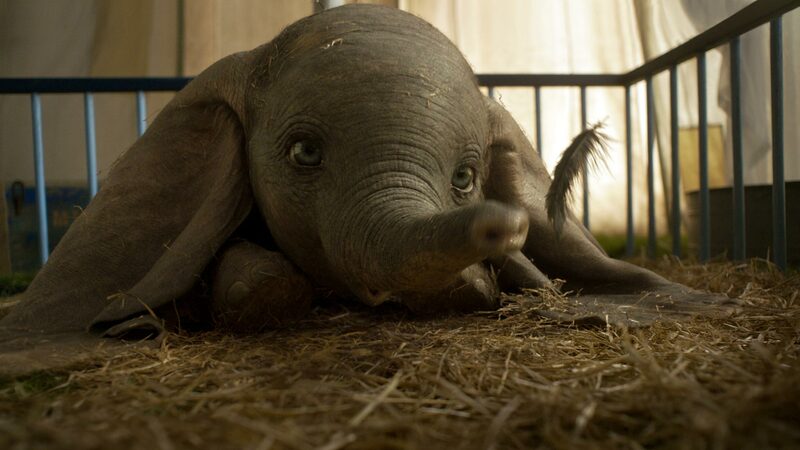 Baby Dumbo is probably the cutest character to be adapted into a Disney live-action remake franchise. Dumbo nails the cuteness factor. It’s just a shame his CGI stands out like a sore thumb and his movie never reaches beyond par. Dumbo, while adequate, doesn’t take any bold or inventive risks re-telling one of Disney’s oldest films and what direction it does select feels unbelievably clichéd. That’s not a statement I like making, especially about work from a director like Tim Burton, whose work was once defined by his unpredictable quirkiness. Unfortunately, what should mesh well between director and character- outsider finding solitude in a literal circus show- feels like Burton going through the motions rather than jumpstarting his 90’s-era brilliance yet again. Admittedly, Dumbo was always going to be an interesting case for the live-action treatment. The 1941 animated film starred a mostly animal cast, lasted just over an hour, and Dumbo’s infamous aerodynamic ears didn’t take priority until the third act. What we remember about Dumbo are the “weird” bits from Walt Disney’s early days, for better or for worse. The heartbreaking “Baby of Mine” sequence. Dumbo getting drunk and hallucinating about nightmarishly surrealistic pink elephants. And, of course, the infamous racial stereotype exemplified by crows whose leader was named… Jim. Cute Dumbo flying might be timeless but a good portion of Dumbo needed to stay in the 40’s. This makes the live-action Dumbo more of a soft reboot than a full-on remake, revamping the original story into a two-hour Burton fairytale that does its own thing with the source material. It’s just that, when you remove Dumbo himself from the equation, we’ve seen multiple variations of this storyline before. 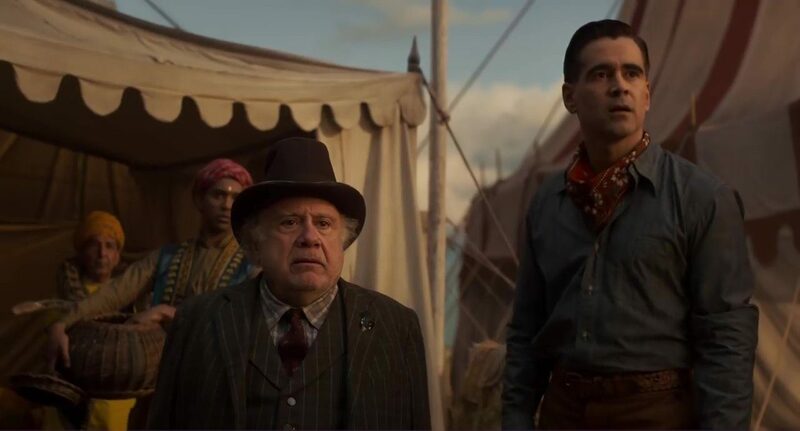 Taking place in post-WWI 1919, horse rider and war veteran, Holt Farrier (Colin Farrell), returns home to his two kids and old job at the Medici Brothers Circus. Once a tight-knit, scrappy, and rather diverse array of circus performers, the circus has unfortunately seen better days. Farrier lost an arm in the war, his wife was amongst many entertainers who died of fever, and ringmaster, Max Medici (Danny DeVito), had to sell the horses to prevent bankruptcy. In exchange for the horses, Medici got a pregnant elephant named Mrs. Jumbo, who soon gives birth to baby Dumbo— an adorable little elephant cursed with freakishly big ears. Much like the animated movie, Dumbo’s big ears earn him cruel jeers from spectators, causing his mother to rampage against the hecklers and be sold off to avoid further bad publicity. 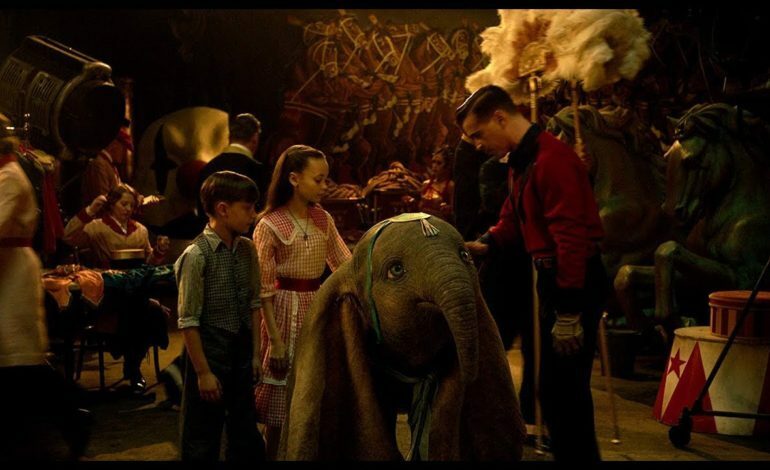 Unlike that film, Dumbo isn’t ostracized by the circus performers but instead finds a new family in them, specifically with Holt’s kids, Joe (Finley Hobbins) and Milly (Nico Parker). It is they who discover Dumbo’s ability to ear-fly, namely by inhaling feathers and prompt him to do so at the next big show. This makes Dumbo a hit with the crowds but also concludes the film’s first act at exactly the point where the original film ended, period. Which raises the question, how does Burton adapt the story into something new? The result, sadly, is something far more formulaic than it wants to admit. Dumbo’s fame attracts the attention of entertainment tycoon, V.A. Vandevere (Michael Keaton) who seeks to incorporate Dumbo and the Medici circus into his expansive amusement park, Dreamland. Of course, being a larger than life entertainment mogul in film, it’s obvious Vandevere just wants Dumbo from the acquisition, hoping to pair the flying attraction with his trapeze artist girlfriend, Colette Marchant (Eva Green), while tossing the other performers to the curb. Given the lack of subtle comparisons between Dreamland and Disney’s own Tomorrowland exhibit, however, this makes Vendevere a rather weird mashup of P.T. Barnum and Walt Disney himself. Or rather the ever-growing media mogul image of Disney and its acquisition of… everything really. I mean, this a business that made Dumbo, made the movie remake of Dumbo, and will likely make a circus-load of money from Dumbo‘s critique of their business practices. Right as they completed the 20th Century Fox merger, no less. Those parallels are far more noteworthy than Keaton’s performance, which comes across as bland rather than fun scenery-chewing. A similar critique could be made of the other cast members. Farrell is a decent enough lead as Holt but the absentee father figure struggling to reconnect with his family is hardly a new archetype, especially if you’re familiar with Spielberg movies. It also doesn’t help that the actors playing his kids have really stiff line delivery, even when conversing with cute baby Dumbo. DeVito, however, pleasantly stands outs as Medici, a charlatan of the entertainment spectacle who nonetheless cares about his performers as a family rather than as disposable props. He and Eva Green, whose scenes with Dumbo and the Farrier family are just sweet enough to feel poignant, feel like the most natural performances. Everyone else is trying but, as stand-in protagonists for Dumbo himself, they aren’t very interesting. That’s not to say Dumbo is entirely devoid of charm. There are a few good jokes here and there. The background circus performers are likable despite their underdevelopment, especially a strongman who doubles as both musician and legal accountant. The costume design is on point, contrasting period-piece attire against Dreamland’s art-deco futurism landscape in what I think is supposed to be a critique of big business overreach. Of course, given how this is Disney overseeing the storyline, it’s hard for anyone to look at Burton’s message, no matter how well-meaning, with much straight-faced credibility. Yes, there is some emotional value in watching the cast comfort Dumbo during his moments of pain. But kitsch isn’t a stand-in for great storytelling, no matter how lovable the VFX department makes its titular elephant. Dumbo simply doesn’t venture beyond a conventional plot with occasional references to the original film. The pink elephants appear less as an out-of-body drunken experience than as a neat visual stunt. Someone sings a rendition of “Baby of Mine” but it doesn’t come close to hitting the same emotional beats. 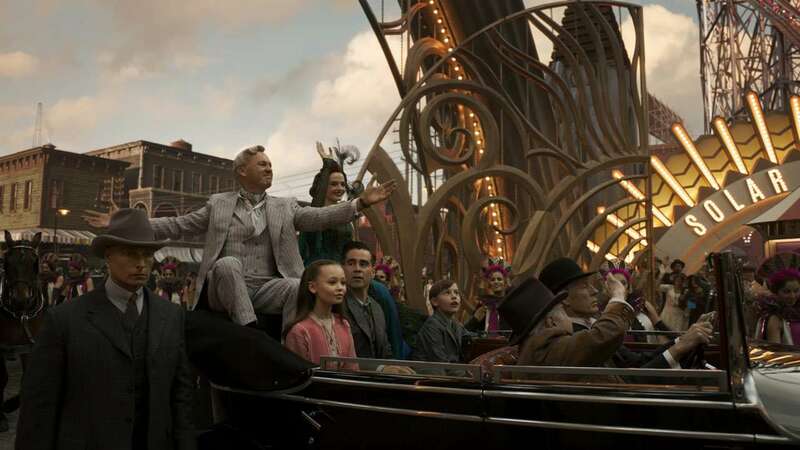 It’s serviceable visually and non-diegetic directing coming from a director once beloved for planning films with a surreal personality unlike anything else in Hollywood, to the point that even Dumbo’s aesthetics feel like old Burton properties rather than something new. But hey, he didn’t include the racist crows so that’s already a major improvement. Dumbo is perfectly watchable for families, especially given the lack of uncomfortable scenes (and character designs) that made its predecessor infamous. But it’s also not that interesting, with occasional moments of visual spectacle or heart tying themselves to a film that feels by the number. And that’s disappointing because I wanted this to be a genuinely charming film and Batman Returns reunion. You don’t get a better, or weirder, set-up than Tim Burton having Colin Farrell thwart Batman’s attempts to exploit a flying elephant for corporate greed. Though when a corporate enterprise like Disney is pushing that message, one can’t help but marvel at the ballsiness of such irony.